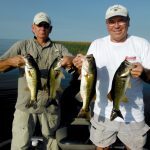 www.okeechobeejust4bass.com was working for Capt Mike Shellen today in similar conditions. We had light winds and a water temp in the high 80’s. This was a 4 hour trip with shiners and artificials with over 25 fish caught. I was fishing with John Manuel of West Palm Beach and his buddy Jimmie Miller of Youngsville, La. Here is a picture of some of them.